Isn’t it amazing what a few drops of rain can do? The eleventh race of the season took place around the legendary Hungaroring, and what a race it was! I felt sure we were in for some more Nico Rosberg dominance, but safety car mis-timings, general track chaos and some interesting strategy choices meant that for the first time in a long time, for the majority of the race I had no idea who was going to win. Rosberg did drive a flawless race, as per usual, but some confusion with the safety car timings, and a multi-21 episode saw him chasing the top three down right till the end of the race, which was excellent to watch! His teammate impressed me hugely by driving to third place from the pit lane, but I do wish he could look a little more cheerful on the podium sometimes. It’s not all doom and gloom, and you finished on the podium after being on fire! I think that’s pretty good going, so smile about it! Ferrari, for the first time in a good few months had an epic race. I believe that the best drivers are revealed when they’re driving terrible cars, and I think you would be hard-pressed to find a better driver right now than Fernando Alonso. 30+ laps for him and Raikkonnen on soft tyres is an amazing feat in itself, and I think that if the strategy calls in qualifying had not affected Raikkonnen he would also have been challenging for a podium. 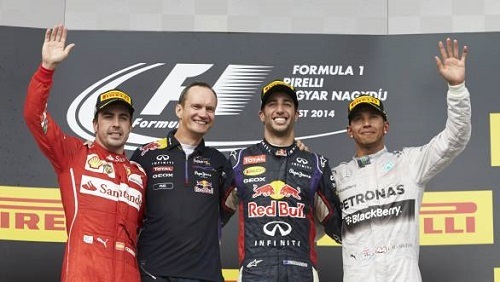 (It was so good to see red on the podium again – I’ve been waiting since China! Next step – the Italian Anthem!). 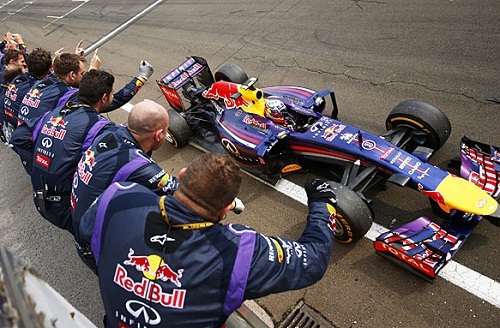 The Red Bull team had an excellent race as well, with Vettel even spinning on the track and still managing to miss the wall (how?). He drove an incredible race and proved he is still hunting down a fifth title, despite how impossible it may seem right now. And Daniel Ricciardo. What a superstar. I am always happy to see him succeed, and I think he has driven out of his socks this year – we have a future world champion here I don’t doubt! Love seeing him, and his gigantic smile taking on two world champions in the dying stages of the race, on the podium! Force India had a pretty awful day out yesterday, with both cars failing to finish, which is a major blow considering how well they have been running so far. It was the first time in the season that Nico Hulkenberg did not finish in the points, and is something that I am sure will bug him throughout the summer break. Sergio Perez was involved in a major crash with the wall, causing one of the safety car periods of the race. He walked away unharmed, but is no doubt also upset with himself. The safety cars played an integral part in the drama of the race yesterday, causing re-shuffling of the pack twice in ways that nobody imagined. The first safety car took the leaders by surprise, causing them to have fight their way back through the field after they missed a crucial pit-stop period. It was this safety car re-shuffling that saw the Williams strategy suffer, and without the safety cars I have no doubt that Bottas would have been standing on the podium instead. McLaren also missed out on making the race their own with poor strategy calls and lack of pace. There was a lot of pressure on Jenson to perform, considering he is known as a wet-weather specialist, but he was unable to find the form necessary to challenge for position. His teammate did not fair much better, and crossed the line in a disappointing twelfth. 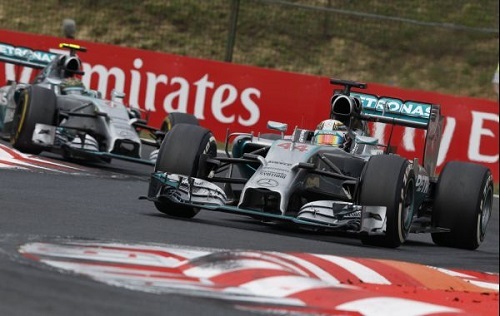 A multi-21 scandal reared its ugly head between the two Mercedes drivers in the final stages of the race, with Hamilton being told to move out of the way for Nico. He responded that Nico would have to get closer first, and managed to fend off the German right to the end of the race. The team has since rescinded the order to Hamilton, quoting it as a mistake, but it clearly shows that there is no love lost between the two drivers, and gives the Mercedes camp something to think about over the summer break. As F1 breaks for the summer, there is a lot for all of the teams to think about. For sure the multi-21 issue needs to be sorted, as I am sure nobody wants to see that between two title contenders, and car development needs to come to a head now before the focus turns to next season. The Hungarian Grand Prix provided us with enough stress and emotion to last until Spa, so thank you F1 for reminding me why I love you. It’s been a while. See you all after Spa! Driver of the Day: Tied between the podium winners who each performed feats of greatness throughout the race. Fail of the day: Mercedes Multi-21. Never again please boys.